Dominik Baumann was competing in the final race of the 2018 IMSA WeatherTech Sportscar Championship last weekend. 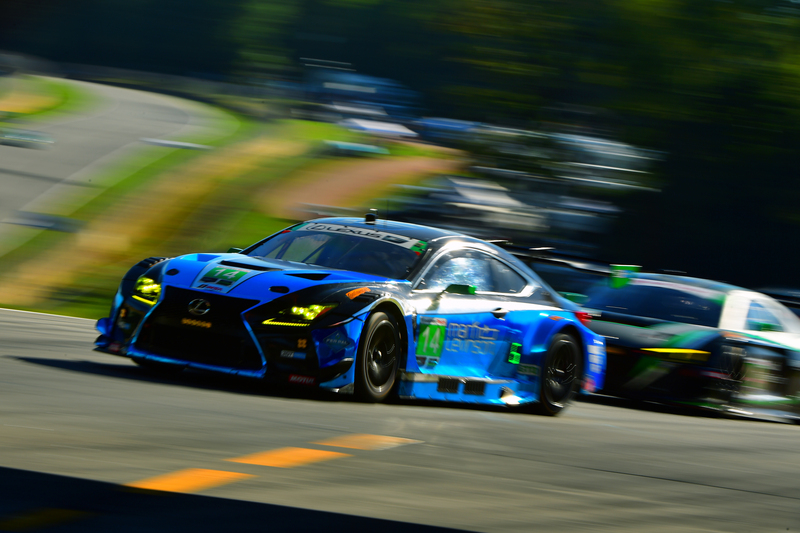 In the 10-hour Motul Petit Le Mans at Road Atlanta, Baumann was sharing the cockpit of the number 14 Lexus RC F GT3 entered by 3GT Racing with team-mates Kyle Marcelli and Philipp Frommenwiler. In the first three of four practice sessions, the trio gradually worked their way up the timesheets from eleventh to sixth and third. The fourth practice was a disappointment, however, as they dropped back to tenth. P8 in qualifying was a reasonable grid position from which to tackle the ten hour race in the US state of Georgia. In the race itself, Baumann, Marcelli and Frommenwiler made a breakthrough into the Top Three at one point. Baumann was then running fifth when a tyre came loose on their Lexus RC F GT3. This dashed any hope of getting a result. The race was effectively over for the trio at the midway point, and they were reduced to the role of spectators for the final stage contested in the dark. Despite the zero points haul in Georgia, Baumann finished his first season in the IMSA WeatherTech Sportscar Championship fifth in the GTD class. In his rookie year in the USA, the Austrian and his co driver Marcelli achieved one major historic success by delivering a maiden IMSA WeatherTech Sportscar Championship victory for Lexus on the Ohio weekend. A second victory followed at the Virginia International Raceway. In Marcelli’s home race in Canada, the duo made yet another podium appearance, this time for having finished as runners-up. The season finale unfortunately came to a premature end for you. What happened there? We lost a tyre shortly after a pit stop. Something must have gone wrong when we were changing tyres. I tried to return to the pits on three wheels, but that didn’t work. I finally got there with the help of a tow truck. We repaired the car and went back out onto the track, but we had to give up after a short while. Something was wrong with the car, but we don’t yet know what it was. How had the race gone for you up to that point, and what do you think you might otherwise have achieved? Qualifying in eighth place was not ideal, but fortunately that does not matter so much in such a long race. We fought our way up into the Top Three as the race progressed. When we lost the tyre, we were in the Top Five. The car was running well, and we might have made it onto the podium. However, our sister car had problems with its brakes in the last hour, and we would probably have suffered the same fate. Which of the stints did you drive, and what were the conditions like? I drove two stints at the beginning. Then Kyle and Philip each completed double stints. When I was back in the cockpit at around the halfway point, the problem with the tyre cropped up. The conditions on race day were consistently good, with plenty of sunshine. On Wednesday, we caught the tail end of the hurricane, although it wasn’t too severe. Unfortunately, we didn’t get to do any night-time driving because of our retirement halfway through, but that would have been really cool. How satisfied are you with your first season in the IMSA? On the whole, it has been a good year. For me, everything was new: the car, the tyres, the tracks… I mastered the challenge well and had a lot of fun. I have built up a firm friendship with my team-mate Kyle: we can read each other like a book. It was definitely the right decision to go to the USA to develop myself as a driver and as a person.